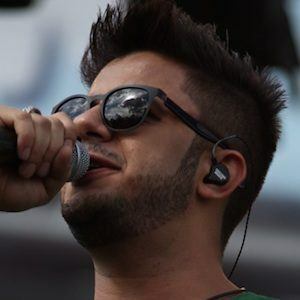 Brazilian singer and songwriter, known for his singles "Efeitos" in 2011, "Você mudou" in 2012, "Maus bocados" in 2013, and "Cê que sabe" and "É com ela que eu estou" in 2014. He also released two concert DVDs and 3 studios albums throughout the course of his life. He died in a tragic car accident in 2015. He learned to play guitar when he was six years old and began composing songs at ten years old. When he was 13 years old, he released his first EP and performed on Brazilian television. He was then asked to be included in Brazil's popular children's albums "Jovens Talentos." When he was 17 years old, he formed a duo with his sister Ana Cristina but they reached only local success. When he was 24 years old, he finally made the leap to go solo. His first solo album Efeitos was released in 2011. It was a tragic car accident that took his life and the life of his 19 year-old girlfriend Allana. His bodyguard was driving and lost control of the car while the two were asleep and not buckled in the back seat. He was born and raised in Goiás, Brazil, where he also died. His parents are João Reis and Zenaide Melo. He collaborated with international pop star Ian Thomas on his live album and concert DVD of Ao Vivo em Cuiabá in 2014.